Whenever I learn that a Hollywood remake of a classic film is about to reach the big screen, I think to myself “Hollywood has run out of ideas” (but it’s not just Hollywood). With very few exceptions, remakes are passable at best, horrendously offensive at worst. However, every now and again (not often enough, for my liking) there comes a remake that is not only a superb piece of cinema on its own terms, but can also be compared favourably to its predecessor. Such can be said of Scarface (1983), the epic crime drama directed by Brian De Palma; the film where Al Pacino portrays his most over-the-top character a Cuban refugee and notorious underworld figure Tony Montana. Perhaps there are readers who have visited the Astor Theatre numerous times to see Brian De Palma’s Scarface yet haven’t seen the original film version, released in 1932, or, until now, have been totally unaware of its existence. If you are one such reader, then you would be correct in guessing that the Depression Era edition is nowhere nearly as graphic as its 1983 counterpart. 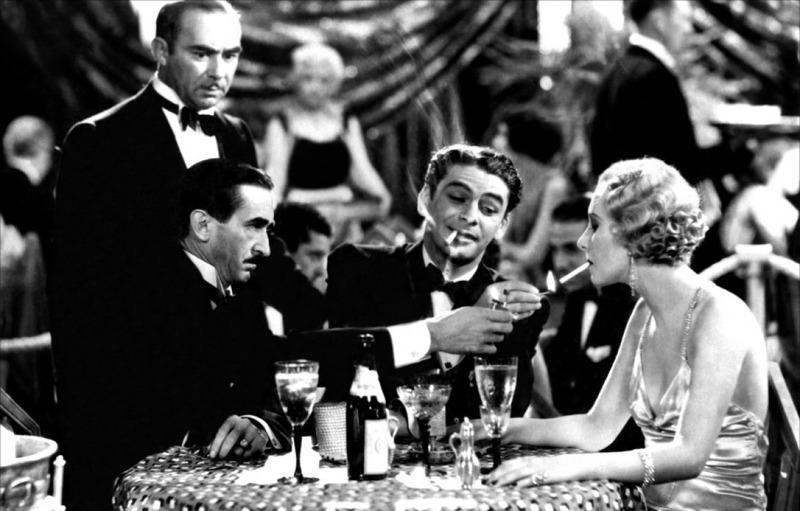 That said, for its time, the original Scarface was extremely controversial, a product of what is known as the Pre-Code Era. The Great Depression swept across the United States, causing severe financial hardships for countless Americans. The joyful ritual of visiting the cinema suddenly became a luxury for working class Americans and, in times of economic disarray, such luxuries are often sacrificed in favour of necessities. Desperate to lure audiences back to the cinemas, Hollywood took advantage of the relatively lax censorship guidelines (prior to rigid enforcement of the Hays Code in 1934) to present films with taboo subject matter. Numerous films about organised crime, Scarface among them, exhibited levels of simulated violence previously unseen on the big screen, as millions of Americans who had only read and heard about the criminal exploits of real-life gangsters, such as Bonnie and Clyde and the real “Scarface”, Al Capone, flocked to cinemas to see hard-boiled fictional gangsters played by Hollywood actors. Directed by Howard Hawks, the original film (Scarface: The Shame of a Nation, based on the novel by Armitage Trail) is one of the most celebrated of these Pre-Code crime films. It is worth noting that in the 1960s, the Code was revised, then abandoned in favour of a ratings system—with the rapidly burgeoning popularity of televised entertainment in loungerooms across the United States, Hollywood again changed tack to lure audiences back to the cinemas, picking up where the Pre-Code period left off several decades earlier. Bonnie and Clyde (1967) was one of the first films to take full advantage of Hollywood’s increased liberalism—and how fitting this was, as the real Bonnie Parker and Clyde Barrow, legendary outlaws of the Great Depression, were at their most active in the early 1930s, the Pre-Code period, before their demise in 1934. An especially graphic film in terms of its depiction of violence, Bonnie and Clyde started the modern trend of ultra-violent crime cinema that would reach new extremes with the release of the Scarface remake in 1983. Readers who have seen the 1932 version as well as its 1983 successor will note, despite the obvious stylistic differences between the two, numerous similarities that link them together, a few of which are mentioned below. Most obviously, both films feature a dangerously ambitious protagonist named Tony (Tony Camonte, as played by Paul Muni, in the 1932 original, Tony Montana in the 1983 remake) who is determined the become a major player in the criminal underworld. Tony Camonte seems obsessive about protecting the sexual purity of his younger sister Francesca (Ann Dvorak), as is Tony Montana in regards to his junior sibling Gina (Mary Elizabeth Mastrantonio). In both cases, it is suggested that Tony’s motivation for steering his sister away from potential suitors is less about protecting her virtue and more about his own taboo desires (those readers who have seen Alexander Mackendrick’s 1957 classic Sweet Swell of Success, and recall Burt Lancaster’s J.J. Hunsecker character and his possessiveness regarding his teenage sister Susan, will understand what is being implied). 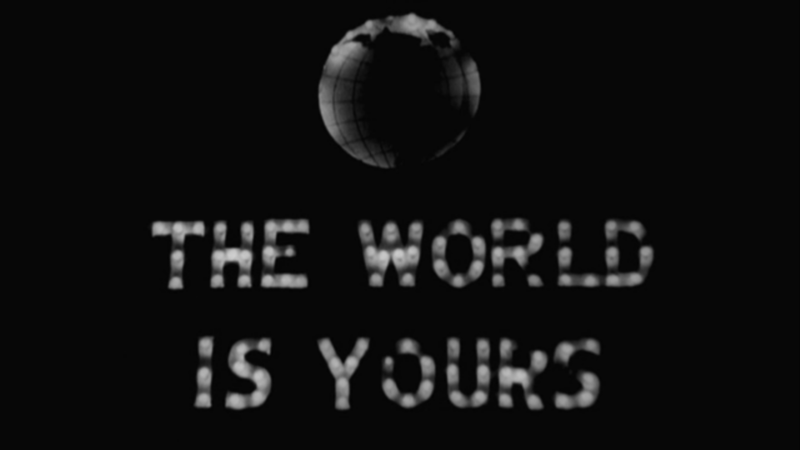 Even the scene in the 1983 remake where Tony Montana gazes at a Pan-Am blimp, with its advertising slogan “The World Is Yours”, is a direct hommage to its 1932 predecessor, as illustrated below. They say that money can’t buy happiness. This is definitely true in the case of Tony Montana. The more influential he becomes in the criminal underworld, the wealthier he gets, but of course it also means that he makes more enemies for himself, which then makes Tony even more distrusting of others. Almost nobody is safe from Tony Montana and, as we shall learn before the conclusion of this epic crime thriller, Tony Montana is safe from almost nobody else. The world might belong to Tony, but after a while, he questions, loudly and profanely, if it’s a world worth having, in a drunken restaurant monologue that is one of the highlights of the film. 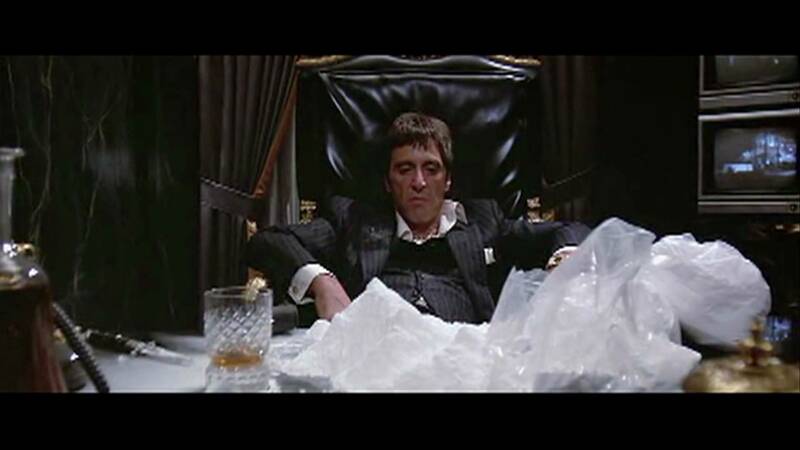 While some will claim that Tony Montana is a self-made success – which is to say that his millions of dollars is all that matters – the reality is that Tony is a loser, a victim of his own insatiable avarice. It’s easy to fall under the spell of Tony’s larger-than-life personality, a testament to the charisma of Al Pacino (let’s face it, Pacino, who disappears into his role, is rather funny as Montana—I have a Tony Montana talking keychain somewhere, he’s one of the most quote-worthy characters in the history of cinema!) But despite being a psychotic killer and drug baron, Tony his own moral boundaries, refusing to commit to any assignment that may directly endanger the lives of women and children. Of course, Tony seems to forget that the men he either kills personally or has killed by his goons may be partnered with children of their own. There is no telling how many children Montana has left fatherless, no guessing how many widows he has made, and no way to count how many women and children have become addicted to the thousands of kilos of poisonous white crystals that he has sent flooding into the cities of the United States. 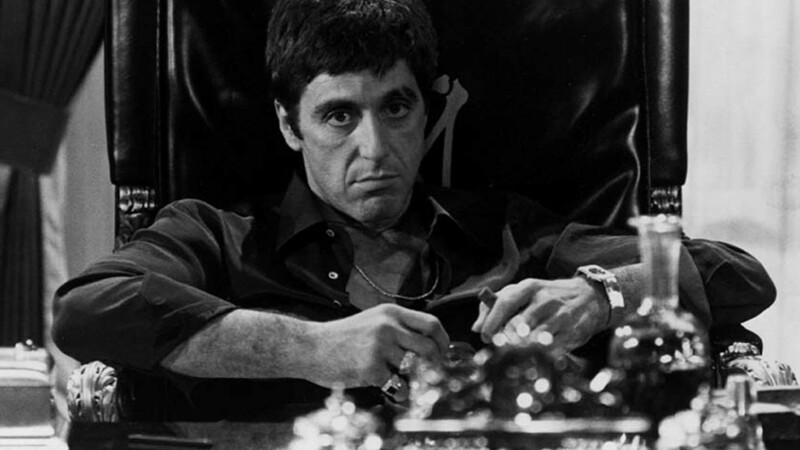 But in the mixed-up mind of Tony Montana, he is a criminal with a conscience. But going back to the restaurant scene, for those who have seen it, we must ask ourselves, is Tony Montana really “the bad guy”? This is to ask, is he really any worse than the countless “respectable” types typically adored by society, who screw and manipulate their way to the top legally, albeit no more ethically than the likes of Montana? Remember, this film was released in 1983. Ronald Reagan was in the White House, and along with his wife, Nancy Reagan, declared the “war on drugs” which, unfortunately, was not accompanied by a “war on poverty” and a “war on greed”. The so-called “war on drugs”, much like the current “war on terror”, was merely an empty promise designed to draw favour from the more reactionary elements of American Society. Let us not covet Tony Montana’s tragic lifestyle, fuelled by a certain misguided desperation to escape the clutches of poverty, but at the same time, let’s remember that so many “self-made” success stories are anything but self-made, and an overwhelming percentage of the “respectable members of the social elite”, whether they be politicians, casino owners, world bankers, diamond barons, you name it, profit greatly from the misery of others. It’s just that unlike Tony Montana, they don’t get their hands dirty. De Palma’s Scarface is a masterpiece of modern cinema. 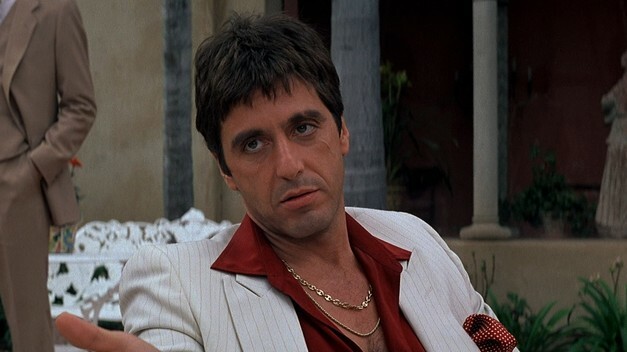 If you have not yet delved into the blood-soaked, drug-polluted, money-grubbing world of Tony Montana, you have the opportunity to do just that (at a safe distance that cinema affords, of course) at the Astor. And, if you ever have the chance, please do take a look at Scarface: The Shame of a Nation as directed by Howard Hawks, one of numerous classics available from the world of Pre-Code cinema. Written by Mark Vanselow for The Astor Theatre.